Discussion in 'Android Lounge' started by Roze, Apr 25, 2012. I found this comprehensive comparison between all of the cloud based storage companies on the net. I never realized that there were so many, and I have always been curious as to what the difference between them all were. While Google Drive isn't much more than a Docs rebranding that syncs to a folder on your computer, it has a few key features that make it worth checking out. 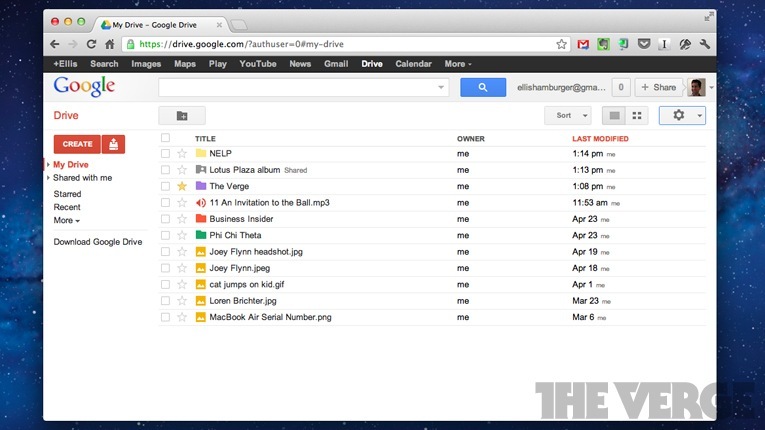 First, Drive can open up to 30 kinds of files right inside your browser. Dropbox and a few others open files inside a "web gallery," but Drive opens Photoshop files &#8212; even if you don't have Photoshop on your computer. To this extent, Drive creates a QuickLook-esque experience inside your web browser that makes it much easier to thumb through files. Drive also includes an option to turn on OCR text scanning, which means that when you upload images to Drive, Google will scan the images for text and make them searchable (similar to Evernote Premium). In terms of everyday use, Drive offers the same drag-and-drop syncing as Dropbox, and lets you pick which folders inside Drive you want to sync from within the desktop app. Also like Dropbox, you cannot pick other folders on your computer to sync to Drive. In this way, Drive's real strengths lie on the web and with the features we previously mentioned. It'll also tie right in to Google+, Gmail, Android, and other Google services that will let you drop-in or upload files (almost like you might with attachments inside Sparrow for Mac, which can instantly upload attachments to CloudApp). Additionally, Drive features a built-in document editor on par with Microsoft's online Office suite that's part of SkyDrive. You can't yet use Drive with multiple Google accounts, which is a pain, but we'd expect that feature in due time. Drive launches on the web, for Mac, Windows, and Android devices today, with iOS support on the way "in the coming weeks." The Android app (which replaces Google Docs) won't stream your content, however, unlike some competitors like Dropbox and SugarSync. For a full hands-on of Google Drive, click here. Pricing: Drive comes with 5GB of storage free, with generous upgrade options like $2.49/month for 25GB of extra storage and $4.99/month for 100GB of storage. Pricing: 25GB for $2.49/month; 100GB for $4.99/month; 200GB for $9.99/month; more options from Google. 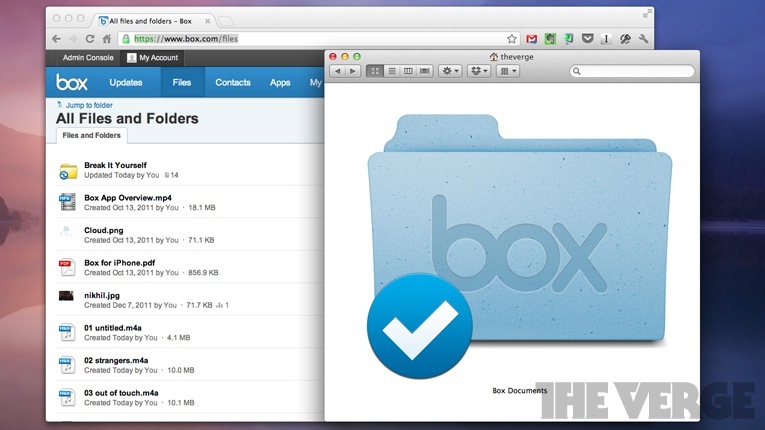 Dropbox is the go-to solution for syncing files across multiple devices for a reason. It's a no-brainer to use, allows groups to share files with a couple clicks, and offers few settings for you to mess up. Perhaps the app's greatest strength is the API it's built on, which hundreds of developers have used to create apps that utilize Dropbox. It's right up there with Evernote as the most developer-friendly storage/syncing platforms that apps can leverage to help you access your data everywhere. But, Dropbox does have some drawbacks: It offers just 2GB of storage for free, and forces you to keep everything you need synced inside of just one folder (though you can pick which folders you want synced within your Dropbox). Extra storage is also very expensive &#8212; Dropbox offers 100GB of storage for $19.99/month, while Drive offers the same amount of storage for $4.99/month. Additionally, it would be pretty futile to try to use Dropbox as a complete backup tool because it would mean that you've have to store everything you want to back up inside your Dropbox folder. Dropbox is ultra-reliable and plugged in to all your favorite apps, but doesn't offer a ton of options. Pricing: 50GB for $9.99/month ($99.99/year); 100GB for $19.99/month ($199.99/year). SugarSync is perhaps the most well-known alternative to Dropbox, and even comes pre-loaded on all new Lenovo computers and some smartphones (like devices from SoftBank). SugarSync's claim to fame is that it's on just about every platform, gets updated frequently, and lets you micro-manage what you want to sync. 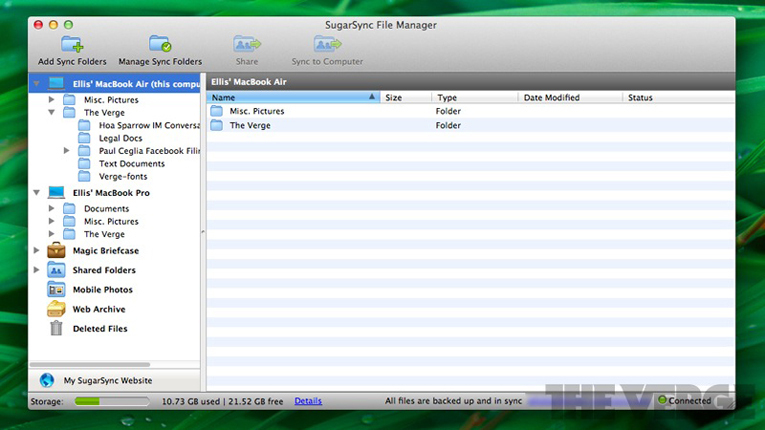 For example, SugarSync lets you pick folders all over your computer to sync, then lets you choose whether you want each folder synced to all of your devices, or to just specific devices. Additionally, SugarSync lets you add password protection to files and folders when sharing them publicly, which not all competitors can't brag about. The company's app for iPhone and iPad is also decent (though it's pretty ugly, like the desktop app), and even allows you to stream a whole album of songs in a row from the cloud, unlike Dropbox. Lastly, SugarSync gives you 5GB for free to join. Pricing: 30GB for $4.99/month ($49.99/year); 60GB for $9.99/month ($99.99/year); 100GB for $14.99/month ($149.99/year). Aside from Dropbox, Box might be the most integrated service since its API is so popular with productivity apps like QuickOffice. In this way, it's easy to integrate Box storage into your workflow &#8212; and with sync (offered free, but only to business customers at this point), it becomes even more powerful. There's detailed version-tracking, a feed of every sync and change you've made to a document, elaborate sharing features, and frequently updated and polished apps for just about every platform. Box Sync isn't yet available for consumers, but we'd keep our eyes peeled. Its Google Docs integration combined with tons of collaboration features and sync for consumers would make it a very formidable competitor. But still, like Dropbox, you can only sync with one folder on your computer. Pricing: for personal account, which does not include Box Sync: 25GB for $9.99/month; 50GB for $19.99/month. 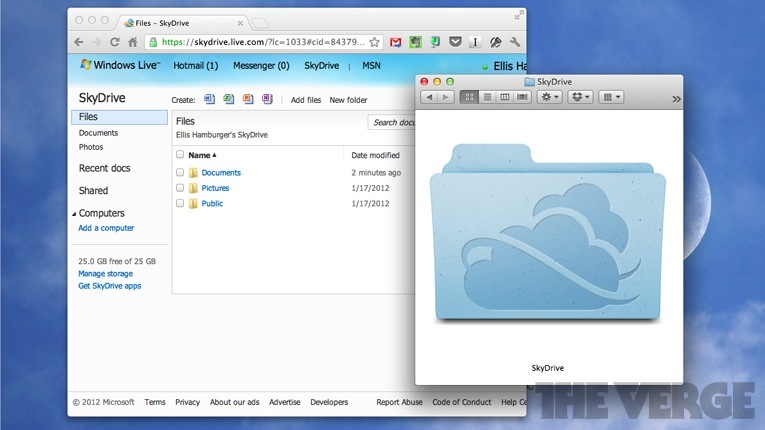 SkyDrive is Microsoft's syncing solution, and in our testing, it works very smoothly. SkyDrive starts things off right by offering 7GB of free storage, which is best in class. If you move quickly (and have used SkyDrive before), you can quickly nab 25GB of total free storage space. SkyDrive really excels at syncing documents created using OneNote and other Microsoft Office products like Word, Excel, and PowerPoint. SkyDrive creates an experience akin to iCloud, but for Microsoft products &#8212; except you can also edit documents in groups like you can with Box or Dropbox. And like with Drive (and Google Docs), you can edit (and create) documents for free within your browser. SkyDrive also lets you share public links, view-only private links, and view/edit private links, which is nice to have. Unfortunately, there's no sharing yet from the Mac app and you can't download items for offline viewing on all mobile platforms. But as a whole, In the end, SkyDrive makes for an extremely well-rounded entry &#8212; especially if you forgot to sync something with it. If your home PC is turned on, you can still access all your files using SkyDrive's "Fetch" feature. Pricing: 45GB for $10/year; 75GB for $25/year; 125GB for $50/year. pastafarian, Crashdamage and rui-no-onna like this. I have had Dropbox for almost two years and like it though there are some shortcoming with them that have been implemented over the years. Only thing that would make Dropbox complete is that it allows syncing folders anywhere on the computer. I've signed up for SugarSync as they have this feature. I have read both Dropbox and SugarSync TOS and they are adequate to what I expect. They make it plain that neither Dropbox nor SugarSync owns or will do anything wrt any items you've uploaded to their cloud storage, i.e. server. I'm hesitant with Google as it does say you own your items but you consent that Google is given a license to everything store and they can do as they wish with it. I refrain from using Picassa and G+ due to the wording of Google's vague TOS.